I entered Elvis in our first show together. He’s been training terrific, feeling really good in his body, and, as always, fantastic in his brain. Of course, three days before the show it occurred to me that I’d never attempted a canter-halt transition. I’d done maybe two extended trots in my entire time with Elvis, zero extended canters and zero rein-backs. So I was super well prepared. Fortunately, Elvis is super at extended canter, very obedient in the rein-back, and good enough in the canter-halt transition, so off to the show we went. 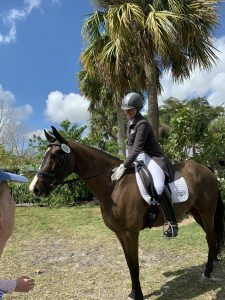 My goal on the first day was to put together an obedient and organized test—and other than the moment where I forgot that the half-pass zig-zag started at the centerline until I was nearly at the quarterline, which made for some creative steering, I did. But he won the Developing Prix St. Georges on a 69 percent, with the comment that for higher scores, I needed more expression and finesse.